It can be quite rewarding to make sure a family story, heirloom, hometown, family tradition, military, immigration or artifact is preserved for future generations. Using the online site ‘Your Story‘ you can easily achieve that goal of preservation as well as sharing a story. As you view the homepage site, there are many categories – clothing, food, adventures, fun, as well as miscellaneous. There are images with most as well the personal story. Click on the US map outline in the upper right corner to see what stories from across the nation originated from and how many. Click on a state of interest and it narrows down where an already submitted story came from. Click on the button ‘Add Your Story‘ on the lower right corner to begin. Here it is all outlined, what to fill in, including photos. The length of the story doesn’t have to be long, 1,500 characters. After filling in the sections and adding the digital photo from your computer – just submit it. Then it can be shared with family and friends anywhere ! 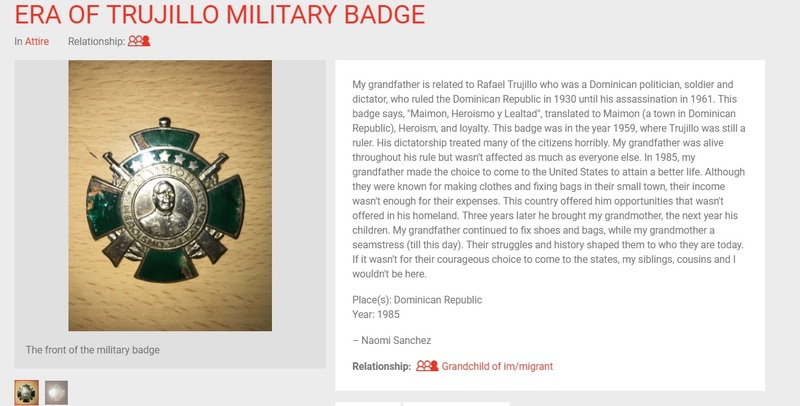 Photos: 1959-the political badge of Rafael Trujillo who was a Dominican politician, soldier and dictator; 1915-family pitcher from Italy- carried by Nicolo and Maria Pica. Nicolo, at first, came to America alone around 1915 then Maria came later with the pitcher; and military medals-1940s.